For over 50 years, attempts have been made to introgress agronomically useful traits from Erianthus sect. Ripidium (Tripidium) species into sugarcane based on both genera being part of the ‘Saccharum Complex’, an interbreeding group of species believed to be involved in the origins of sugarcane. However, recent low copy number gene studies indicate that Tripidium and Saccharum are more divergent than previously thought. The extent of genus Tripidium has not been fully explored and many species that should be included in Tripidium are still classified as Saccharum. Moreover, Tripidium is currently defined as incertae sedis within the Andropogoneae, though it has been suggested that members of this genus are related to the Germainiinae. Eight newly-sequenced chloroplasts from potential Tripidium species were combined in a phylogenetic study with 46 members of the Panicoideae, including seven Saccharum accessions, two Miscanthidium and three Miscanthus species. A robust chloroplast phylogeny was generated and comparison with a gene locus phylogeny clearly places a monophyletic Tripidium clade outside the bounds of the Saccharinae. A key to the currently identified Tripidium species is presented. For the first time, we have undertaken a large-scale whole plastid study of eight newly assembled Tripidium accessions and a gene locus study of five Tripidium accessions. Our findings show that Tripidium and Saccharum are 8 million years divergent, last sharing a common ancestor 12 million years ago. We demonstrate that four species should be removed from Saccharum/Erianthus and included in genus Tripidium. In a genome context, we show that Tripidium evolved from a common ancestor with and extended Germainiinae clade formed from Germainia, Eriochrysis, Apocopis, Pogonatherum and Imperata. We re-define the ‘Saccharum complex’ to a group of genera that can interbreed in the wild and extend the Saccharinae to include Sarga along with Sorghastrum, Microstegium vimineum and Polytrias (but excluding Sorghum). Monophyly of genus Tripidium is confirmed and the genus is expanded to include Tripidium arundinaceum, Tripidium procerum, Tripidium kanashiroi and Tripidium rufipilum. As a consequence, these species are excluded from genus Saccharum. Moreover, we demonstrate that genus Tripidium is distinct from the Germainiinae. Sugarcane (complex hybrids of Saccharum cultum Lloyd Evans and Joshi, Saccharum officinarum L. and Saccharum spontaneum L. ) ranks amongst the top-10 crop species worldwide . Sugarcane also provides between 60 and 70% of total world sugar output and is a major source of bioethanol . However, sugarcane production is dependent on rich soil and plentiful water supply. Sugarcane growth is also highly temperature dependent, with an optimum of 27 °C and an optimal humidity of 85% . This means that the sugarcane-growing belt is limited to the tropical and subtropical regions of the globe. As a result, sugarcane breeders have long had an interest in introgressing traits from sugarcane’s relatives to alter the growing range of sugarcane, to make the plant more productive, to increase its stress tolerance, and to make it more efficient in terms of resource usage (water, soil conditions, nitrogen) . For optimal breeding success, particularly if using genera outside core Saccharum L., an accurate phylogenetic relationship between Saccharum and its purported relatives is a paramount necessity. The concept of the ‘Saccharum complex’ as a set of interbreeding species and the Saccharinae as a subtribe of sugarcane’s close relatives has remained largely unchallenged for 60 years  and has been at the core of all molecular and traditional breeding approaches. These relationships can now be re-evaluated in the light of modern molecular taxonomic approaches. Ever since Mukherjee included Erianthus Michx. sect. Ripidium Henrard within the ‘Saccharum complex’ , a group of potentially interbreeding genera believed to be involved in the origins of modern sugarcane hybrids (Saccharum ×officinarum/Saccharum ×cultum ), considerable effort has been expended in introgressing Erianthus species into the sugarcane gene-pool. Clayton and Renvoize  included Erianthus in the subgenus Saccharinae Griseb. (along with the genera Eriochrysis P. Beauv., Eulalia Knuth, Eulaliopsis Honda, Homozeugos Stapf, Imperata Crillo, Lophopogon Hack, Microstegium Nees, Miscanthus Andersson, Pogonatherum P. Beauv., Polliniopsis Hayata, Polytrias Hack, Saccharum and Spodiopogon Trin), suggesting that Erianthus was closely allied to Saccharum. Indeed, this paper has had considerable taxonomic influence and Kew’s GrassBase defines former Erianthus species as part of the Saccharum genus . However, the paper of Hodkinson et al. , though using relatively few characters for their phylogeny, demonstrated that Erianthus was not monophyletic. The Old World Erianthus species (sect. Ripidium) clustered as sister to Eulalia and Zea L., whilst the New World species and Erianthus rockii Keng (Saccharum longisetosum (Andersson) V. Naray.) clustered as sister to Miscanthidium Stapf. Hodkinson et al. proposed the name Ripidium (following Grassl  and von Trinius ) for the genus corresponding to Old World Erianthus species. This name, however, was found to be invalid, as Berhnardi  had already proposed Ripidium for a fern species within the Schizaeaceae, and Valdés and Scholz  proposed Tripidium as a replacement. To fully understand the problems associated with the naming and taxonomic positioning of Erianthus/Tripidium species, we must be fully conversant with the taxonomic origins and derivations of these genera and the potential use of species within them to sugarcane breeders. The Old World species of Erianthus are highly caespitose (forming dense clumps); indeed, Grassl  defined them as ‘tufted bunch grass types’ and it was this dense bunching habit and efficient ratooning that initially led sugarcane breeders to attempt the introgression of Erianthus characteristics into sugarcane. The deep rhizomes of Erianthus species also mean that they have improved water use and nutrient use efficiency as compared with members of genus Saccharum (even some highly rhizomatous Saccharum spontaneum accessions) . Genus Erianthus was first defined by Michaux , with the name being derived from the Greek ‘Erion’ (wool) and ‘anthos’ (flower), referring to the woolly glumes possessed by members of the genus. The New World species are found in the Americas, whilst the Old World Species occur from Mediterranean Europe through India, China, South East Asia, New Guinea and Taiwan. As the Old World species (originally placed under the section Ripidium) have always been believed to be closest to Saccharum (and part of the ‘Saccharum complex’ and the Saccharinae) they are analysed in detail within this paper. For reference, the nomenclatural history of species within Erianthus sect Ripidium (Tripidium) is given in Table 1. Following the work of Valdés et al. , genus Tripidium currently contains three accepted members: Tripidium ravennae (L.) H. Scholz, Tripidium bengalense (Retz) H. Scholz and Tripidium strictum (Host) H. Scholz. NCBI’s taxonomy also places all species detailed in Table 1 within genus Saccharum, apart from Tripidium ravennae, which is defined as the type species for Tripidium, and Tripidium bengalense . This leaves four additional species (Saccharum rufipilum, Saccharum procerum, Saccharum arundinaceum and Saccharum kanashiroi) that could be members of genus Tripidium, all of which were analysed in this study. A recent publication by Welker et al. , examining five low copy number gene loci, placed the Old World Tripidium (Erianthus) species as sister to a clade formed by the core Andropogoneae, the core Saccharinae and the core Sorghinae (though with relatively poor support). The New World species (Saccharum giganteum (Walter) Pers. [Erianthus giganteus (Walter) P. Beauv. ], Saccharum asperum (Nees) Steud. [Erianthus asper Nees], Saccharum angustifolium (Nees) Trin. [Erianthus angustifolius Nees], and Saccharum villosum Steud [Erianthus trinii (Hack.) Hack.]) were placed within the Miscanthus/Saccharum (Saccharinae s.s.) clade. However, the positioning of Tripidium within the phylogeny of Welker et al. differed slightly from that of the earlier paper of Estep et al. . These authors did, however, propose the recognition of genus Tripidium as separate from Saccharum. Though they included both Erianthus arundinaceus and Erianthus (Tripidium) ravennae, there was no large-scale treatment of Tripidium species and no dating information on the divergence of Tripidium in their study. The paper of Soreng et al. attempting to classify the Poaceae as whole, defined Tripidium as incertae sedis, but they did exclude the genus from Saccharum and suggested that Tripidium could be allied to the Germainiinae (Germainia and related genera). This uncertain placement stems from the reorganization of the Saccharinae and Germainiinae, which left four genera: Eriochrysis, Imperata, Pogonatherum and Tripidium, as incertae sedis . Thus, whilst there is some agreement that genus Tripidium exists, there is no consensus on this finding, and a full circumscription of Tripidium has not been undertaken. Moreover, the species most commonly used in sugarcane introgression breeding (Erianthus arundinaceus) has never formally been included in genus Tripidium. A larger-scale phylogenetic study with more extensive sampling of complete plastomes and genomic loci was always needed before a recommendation could be proposed for the confident circumscription and placement of Tripidium or any of the other genera. All four of the Andropogoneae genera currently defined as incertae sedis are included in the present study, with a large-scale sampling of Tripidium species. It is especially important to compare across genomic and plastome datasets, particularly as the role of hybridization in driving evolution, most especially in plant species, has recently received resurgent attention [19, 20]. Indeed, molecular studies from a variety of taxa across the tree of life have increasingly acknowledged that hybridization is an important source of evolutionary novelty [21, 22]. Pirie et al. revealed ancient reticulation in the Danthonioideae (Poaceae) and ancient reticulation has been revealed in a range of plant genera [19, 24–28]. This is particularly important where there have been ancient rapid radiations , such as in the Poaceae . As a result, the comparison of genome-based and plastome-based datasets is needed to examine the possibility of reticulate evolution within a genus, particularly in grasses where hybridization between lineages is especially common [29, 30]. Based on the existing evidence, it can be concluded that genus Erianthus is not monophyletic and that the New World Erianthus species are separate from the Old World species. Whilst the New World species may be allied to the Saccharum genus, the Old World species are not. Thus, the current inclusion of all former Erianthus species into Saccharum (as at Kew’s GrassBase  and the NCBI Taxonomy ) is almost certainly erroneous and is in dire need of re-evaluation. The Tripidium (Erianthus sect. Ripidium) genus includes members with chromosome numbers of 2n = 10, 20, 30, 40 and 60 . Though, in common with other members of the Panicoideae, the base number is x = 10, which is the same as for genus Saccharum . As a genus, Tripidium possesses a number of agronomically useful phenotypic features namely: cold tolerance, drought tolerance, heat tolerance, salt tolerance, disease resistance, improved vigour, dense culm spacing and increased ratooning . As Erianthus was included in the ‘Saccharum complex’ [5, 33] sugarcane breeders have long attempted to introgress the agronomic properties of Erianthus into sugarcane. Typically, introgression breeding involves Erianthus arundinaceus (Tripidium arundinaceum), but it has been difficult to both generate fertile progeny and to identify true hybrids . Subsequent experiments have attempted to utilize cytogenetic tools such as GISH and species-specific markers to follow DNA transmission so that true hybrids can be identified at the seedling stage; and to follow Erianthus genome regions into subsequent progeny [35–38]. GISH  revealed that chromosome elimination occurs in Saccharum hybrid × E. arundinaceus hybrids, indicating that there might be a greater evolutionary distance between Saccharum and Erianthus than predicted solely on the basis of morphological characteristics. Recent studies have shown that the small percentage of true hybrids obtained in Saccharum hybrid × E. arundinaceus crossings are highly aneuploid, with loss and duplication of E. arundinaceus chromosomes as well as frequent interspecific recombinations between sugarcane and E. arundinaceus chromosomes [4, 39]. This phenomenon is characteristic of intergeneric hybridizations (wide crosses between evolutionarily very divergent plant species), as exemplified by oat/maize partial hybrids . As considerable effort has been placed in introgressing Erianthus into sugarcane (typically with poor success) the question of the evolutionary distance between the two genera has both economic and taxonomic relevance. Particularly as molecular data are casting significant doubts on the veracity of the ‘Saccharum complex’ as a whole . Clarifying the taxonomic position of the Old World Erianthus species (the most commonly used in introgression breeding) within the Andropogoneae and to the Saccharum sensu stricto species will help drive forward knowledge-based breeding in sugarcane. We have sequenced and assembled complete chloroplasts from six Tripidium accessions from the South African Sugarcane Research Institute (two of known species and three re-classified as part of this study) and two accessions of known species from the USDA collection as well as an additional Saccharum spontaneum accession . Our assemblies were integrated with 45 previously assembled chloroplasts genomes to yield the most comprehensive phylogenomic study of Tripidium and allied genera within the Andropogoneae thus far conducted. Moreover, a parallel analysis of five low copy number gene loci (63 species) was also performed. Comparisons of whole chloroplast and gene loci phylogenies revealed that the Tripidium accessions were monophyletic, and sister to a clade formed by the core Andropogoneae and Saccharinae. They diverged from Saccharum at least 11 million years ago and are distal to the core Andropogoneae. We also reveal signals of reticulate evolution in genera that are currently defined as incertae sedis within the Andropogoneae. This means that Tripidium should be the preferred genus name for these accessions and that they cannot be part of either the Saccharinae subtribe or the ‘Saccharum complex’. Moreover, Tripidium is circumscribed, based on both whole plastome and low copy number gene locus phylogenies, as a monophyletic grouping with seven confirmed species that is over 8 million years divergent from sugarcane. In addition, we show that the genera Eriochrysis and Eulaliopsis should also be excluded from the Saccharinae, as should Sorghum (based on low copy number gene phylogenetics). Genera Saccharum, Miscanthidium, Miscanthus, Sarga, and Erianthus do form a monophyletic group that could be termed the ‘Saccharinae’. However, of these, only Miscanthus, Miscanthidium and Erianthus are sufficiently evolutionarily close to Saccharum to allow for hybridization in the wild . Thus, the ‘Saccharum complex’ as a group of interbreeding species should be limited to Saccharum, Miscanthus, Miscanthidium and the New World Erianthus species. Chloroplast amplification primers (an additional PDF file details these Additional file 1) were designed to be universal to the Panicoideae, using Saccharum hybrid, Miscanthus sinensis, Zea mays and Cenchrus americanus plastids as references. Wherever possible, tRNAs were used as sites of primer design (these tend to be evolutionarily well conserved). The majority of tRNA-based primers were designed manually with a target melting temperature of 78 °C. For optimal PCR, amplicons were limited to a maximum 20,000 bases. In the few cases where there were no tRNAs available to design primers, the region was input into NCBI’s primer design tool . Final primers were checked with Amplify4  for specificity, primer dimerization and universality. Figure 1 shows a schematic mapping of predicted and subsequently assembled amplicons to the published E. arundinaceus chloroplast genome. There are two gaps in the map, within the IRB region. However, as these two gaps are identical to the sequence on the IRA inverted repeat, we still have complete coverage of the chloroplast (Fig. 2). Primer pair 13 is not shown on the schematic, as this was designed solely to assist with assembly because SPAdes (our assembler of choice) is sensitive to large troughs and peaks in the assembly graph. As the inverted repeats have double the coverage as compared to the SSC (short single copy) region separating them, an additional primer pair covering the core of the SSC region was designed to increase and even out read coverage in this region. Gel images for the amplicons generated for the Tripidium species prior to sequencing are shown as an additional PDF file (Additional file 2). Formal phenotypic analyses were performed on the South African Sugarcane Research Institute’s collection of Saccharum robustum, Saccharum officinarum, Saccharum spontaneum and Erianthus collections (excluding probable hybrids). Based on the possession of ciliate auricles and eciliate ligules, deep (rather than lateral) rhizomes, leaf sheaths that are longer than internode to internode distances, a conspicuous midrib on the leaf underside, leaf blades that taper towards both the tip and sheath and caespitose (clump-forming) natures six accessions were re-classified as Old World Erianthus types which probably belonged to genus Tripidium (see Kew’s GrassBase for detailed species descriptions, which were strictly adhered to ). Accessions showing these features were phenotypically typed in detail and the following accessions were re-classified based on this study: Saccharum spontaneum cv Spontaneum 1 to Tripidium arundinaceum cv SA-E1; Saccharum spontaneum cv Spontaneum 2 to Tripidium kanashiroi cv SA-E2; Saccharum robustum cv IK76–417 to Tripidium arundinaceum cv IK76–417 and Saccharum robustum cv NG77–188 to Tripidium sp. cv NG77–188. Of these, Tripidium sp. cv NG77–188 was the most phenotypically divergent, and despite being clearly caespitose it was much shorter in stature with thin culms that had waxy bands both above and below the internode and narrow leaves. These accessions, along with one accession known to be Erianthus arundinaceus, and one known to be Tripidium ravennae, were subject to chloroplast amplification and sequencing. Based on these studies, and additional phenotypic examination of all species, a new key to the identification of Tripidium species was prepared (Table 2). This is the first key to the identification of all Tripidium species. Key characters: Culms erect, 70–100 cm long, 5–15 mm diameter, rhizomes short, leaf blade hairy at base. Spikelet callus hairs 3–6 mm long. The eight Tripidium plastomes assembled in this study were remarkably similar in terms of size, gene and genome structures. Plastome length varied from 141,105–141,242 bp (Tripidium rufipilum and Tripidium ravennae, respectively), with a mean of 141,168 bp, the LSC (large single copy region) being the most variable. The Saccharum spontaneum SES196 dataset assembled in this study was cognate with the SES205A and SES234B Saccharum spontaneum chloroplasts that we had published previously (Additional file 3). All plastome assemblies had 84 protein-coding genes, 33 non-protein coding genes (ribosomal RNA and tRNAs), three pseudogenes and four origins of replication (Fig. 2) [all counts are for unique genes and exclude duplicates on the second, IRB, inverted repeat]. Plastome sequences derived from PCR amplification (SASRI data) had average read coverage of 330×, whilst plastome sequences derived from reduced representation whole genome amplification sequencing (USDA accessions) had an average of 67× coverage. To test the possible influence of partitioning and the two inverted chloroplast repeats on the chloroplast-based phylogenies both maximum likelihood and Bayesian analyses were run with the second inverted repeat IRB both present and absent from the alignment. Tree topologies in both cases were identical, and branch support showed less than 5% variance. However, backbone branch supports were relatively poor as were some internal branches, particularly within the Tripidium genus. Moreover, Neighbor-Joining, Parsimony Ratchet analyses and SH-aLRT analyses presented an alternate tree topology (particularly within Tripidium and for the relationship of Sorghastrum to the core Andropogoneae and Saccharinae). For an example topology (with supports) using the standard partitioning of the alignment into LSC, IRA and SSC regions see the PDF document of the additional file (Additional file 4). As such, it was decided to further partition the LSC, IRA and SSC regions of the chloroplast into protein coding genes, RNA-coding genes and non-coding sequences (8 partitions in all) with all partitions analyzed independently. This is a much finer partitioning than is typically performed for whole chloroplast analyses and it yielded significantly improved branch supports and a more consistent tree topology. For the final partitioning scheme, two independent runs of RAxML (with different ‘-p’ seed numbers and 100 replicates) yielded the same tree topology, with the best log likelihood -lnL = 409,657.45 (Fig. 3). The current phylogeny focuses on the Andropogoneae, with Arundinella deppeana (a member of the Arundinelleae) as the outgroup. Within the SASRI collection, accessions SA-E1 and SA-E2, were previously identified as Saccharum spontaneum and accessions NG77–188 and IK76–417 were previously identified as Saccharum robustum. This confusion of identification undoubtedly arose due to the presence of rhizomes and the clump-forming nature of these accessions. However, careful phenotypic analyses revealed that these accessions should more properly be included within genus Tripidium, a conclusion that is supported by their monophyly within our phylogeny, particularly if one follows Grassl  in excluding the ‘bunch grass’ types from Saccharum. Our gene locus phylogeny (Fig. 4) is based on the work of Estep et al. . As in previous studies, terminal branches have good support, but internal nodes tend to have poorer bootstrap support (but good BI support), an indication of rapid radiation . The topology is almost identical to the phylogeny presented by Welker et al. , with the exception that we place Polytrias indica as sister to Sorghastrum rather than sister to Sorghum. However, our placement of Polytrias agrees with the phylogeny of Estep et al. . In addition, comparisons between the chloroplast (Fig. 3) and gene locus (Fig. 4) phylogenies show that both phylograms are largely congruent. A side-by-side comparison, presented as a tanglegram (Fig. 5) shows that the gene locus phylogeny and the whole chloroplast genome phylogeny are largely congruent, with only eight genera differing between them. The major differences being the relative positioning of the core Sorghinae, a monophyletic clade formed from Eriochrysis, Imperata, Pogonatherum, Apocopis and Germania and a monophyletic clade formed from Ischaemum, Coix and Rottboellia in the chloroplast phylogeny which splits into two more distal clades in the gene locus phylogeny. 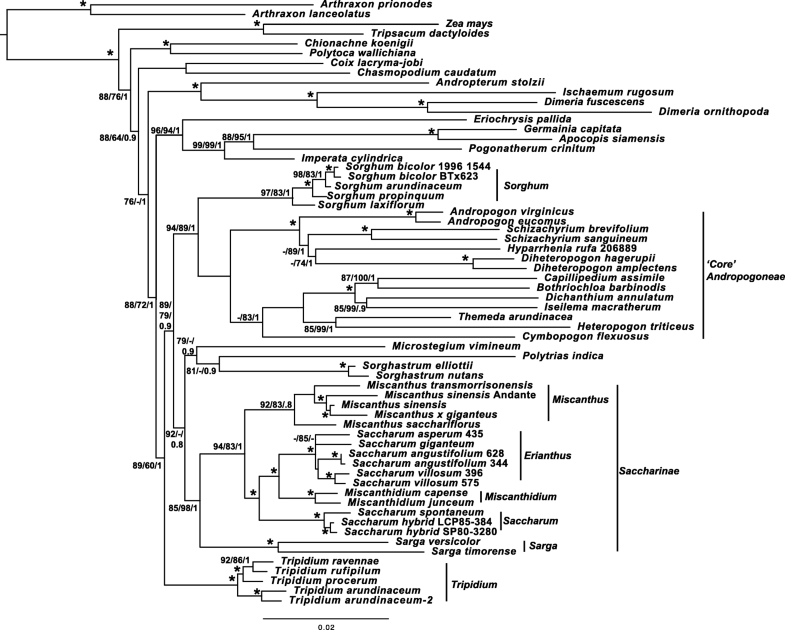 However, monophyly of Coix, Chasmopodium and Rottboellia is confirmed by the work of Estep et al. .
Imperata, Pogonatherum and Germainia remain monophyletic in both phylogenies, but this clade forms an outgroup to the core Andropogoneae and Saccharinae, with good support, in the chloroplast phylogeny (Figs. 3 and 5) whilst it is sister to Eriochrysis with this entire clade being an outgroup to Tripidium in the gene locus phylogeny. 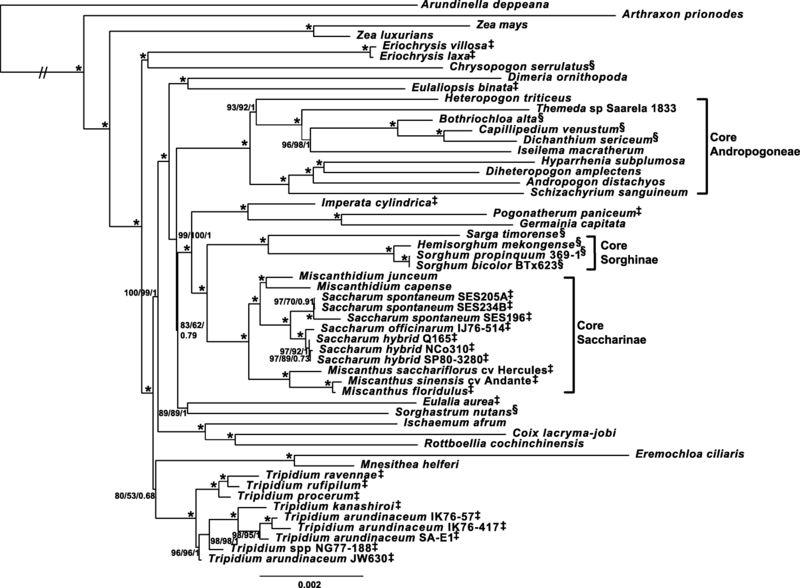 The core Sorghinae form a monophyletic grouping in both phylogenies, but are placed as sister to Sarga in the chloroplast phylogeny and as sister to the core Andropogoneae in the gene locus phylogeny. Coix, Ischaemum and Rottboellia form a monophyletic grouping in the chloroplast phylogeny but monophyly of this group is not supported by the gene locus phylogeny (Figs. 4 and 5) where Coix is sister to Chasmopodium and this grouping is immediately antecedent to a clade formed by Andropterum, Ischaemum and Dimeria. Both phylogenies (Fig. 5) support Tripidium as a monophyletic grouping which, in the chloroplast phylogeny (Fig. 3), has Eremochloa ciliaris and Mnesithea helferi as a sister clade (with relatively weak support). Our two phylogenies support the division of Tripidium into a Tripidium arundinaceum/kanashiroi clade and a T. procerum/T. rufipilum and T. ravennae clade, with near 100% branch support in both groups. Within the core Andropogoneae, a division into a clade represented by Andropogon and a clade represented by Bothriochloa is supported by both phylogenies. 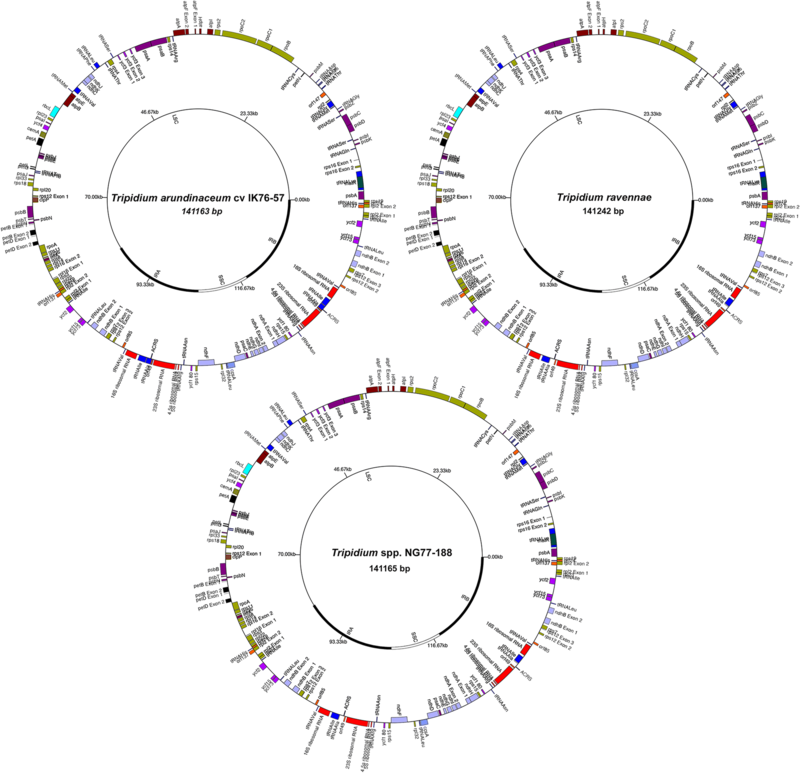 Both nuclear locus and plastome phylogenies also support Sarga as being sister to the core Saccharinae, which is represented by Miscanthus, Miscanthidium and Saccharum. The gene locus phylogeny (Fig. 4) places New World Erianthus species (represented by the type species, Erianthus (Saccharum) giganteus as sister to Miscanthidium. All these genera receive 100% support in both phylogenies as being monophyletic. 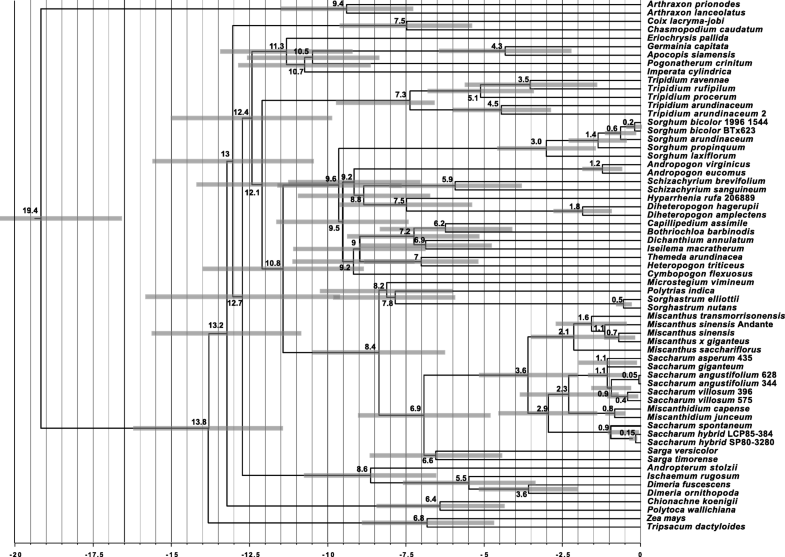 The chloroplast phylogeny chronogram (Fig. 6) and gene locus chronogram (Fig. 7) (both chronograms calibrated on the divergence of Zea mays at ~ 13.8 Mya) concur in placing the divergence of Tripidium at 12.1–12.2 million years ago, with the crown Tripidium species diverging at 7.3–8.4 million years ago (Fig. 5). 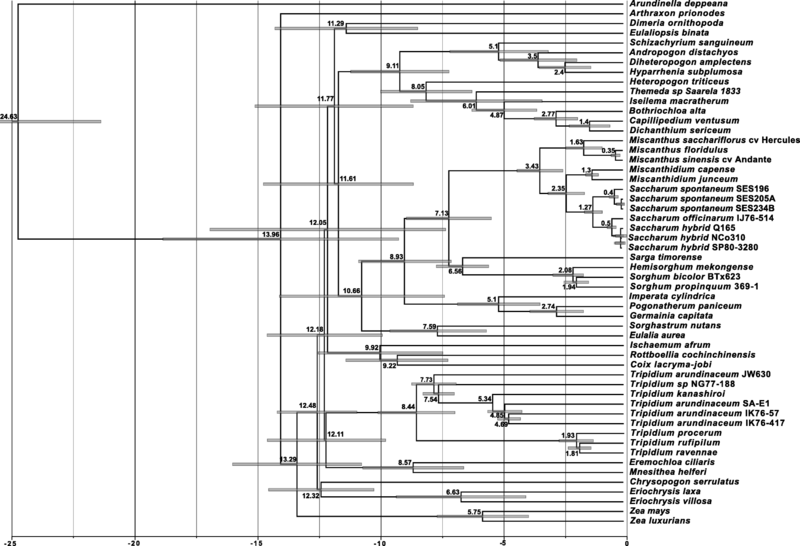 Core Andropogoneae diverged from the Saccharinae at 10.8–11.6 million years ago. The chloroplast-based chronogram (Fig. 6) gives an age for the emergence of the Andropogoneae with Arundinella deppeana at 24.6 Mya. This is consistent with, but more ancient than, the work of Vicentini et al. , placing the origins of Arundinella at 19 Mya. Our age of divergence of Saccharum and Miscanthus at 3.4–3.6 Mya is consistent with previous studies that placed this divergence at 3.8 Mya [1, 17]. The split between Saccharum spontaneum and the crown Saccharum species is consistent with our previous work at 0.9–1.3 Mya . The concept of the ‘Saccharum Complex’ as a collection of interbreeding species resulting in the evolution of sugarcane has had a profound, and probably detrimental, effect not only on sugarcane breeding, but also on the taxonomy of the Andropogoneae as a whole. Many of these ‘Saccharum complex’ species have been placed wholesale into the subtribe ‘Saccharinae’. A good case in point is Erianthus sect. Ripidium. The original definition of this section recognized eight Old World Erianthus species, which Grassl  placed within genus Ripidium. Tropicos, following Scholz  places three species within genus Tripidium  though Kew’s GrassBase places all these species within Saccharum . These inconsistencies, and the current definition of genus Tripidium as incertae sedis within the Andropogoneae necessitates a large-scale molecular phylogenetic study to verify the validity of the genus. Our data indicates that a more complex partitioning scheme than is typically used for phylogenomic studies (see Materials and Methods for details) yields improved branch support and improved topological robustness. 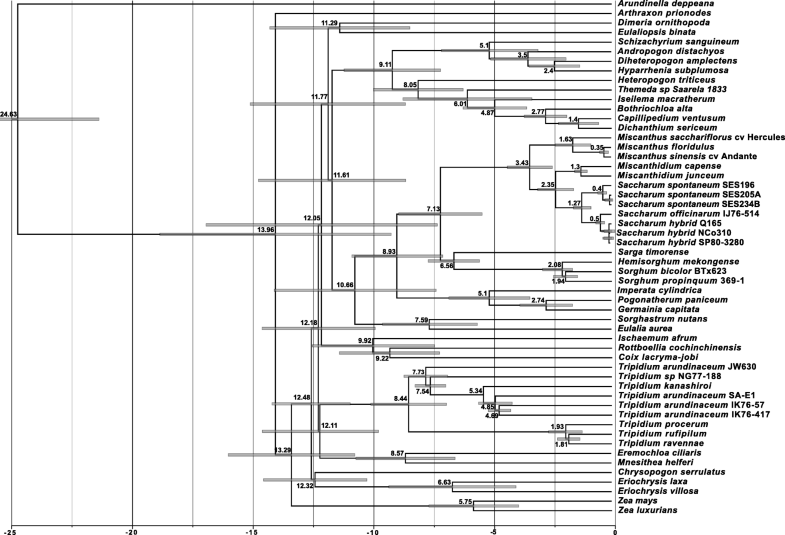 As a result, this partitioning scheme was employed for all phylogenetic analyses reported in this paper. This finding of improved topological support with finer-grained partitioning is comparable to the study of Folk et al. , analysing Heuchera. For the current study, complete chloroplast sequences of eight potential Tripidium accessions and a single Saccharum spontaneum accession as well as low copy number gene loci (apo1, d8, ep2 exon 7, ep2 exon8 and rep1) were assembled. During assembly and sequencing of the gene loci, we observed no secondary gene copies in Tripidium, indicating that there has been no recent hybridization within this genus. Our gene loci assemblies bolstered sampling in Tripidium, Saccharum, Miscanthus and Sorghum as compared with earlier studies [16, 17]. By integrating with previously published data [17, 48] we were able to generate a low copy number gene phylogeny (Fig. 4) to complement our whole chloroplast phylogeny (Fig. 3). Whilst the chloroplast (Fig. 3) and nuclear gene locus (Fig. 4) phylogenies are broadly congruent, a close comparison, presented as a tanglegram (Fig. 5) demonstrates several points of large-scale phylogenomic discord where the chloroplast and nuclear signals cannot be reconciled. Discordance among genomes has long been observed in plants . Both hybridization and incomplete lineage sampling (ILS) cause phylogenetic discordance, yet expected gene tree distributions under these processes are different. Manually comparing the two phylogenies, all discordant branches have good support (greater than 85% SH-aLRT, 70% bootstrap and 0.9 BI), which means false identification of conflict could only occur in cases of systematic error . Moreover, the majority of the examples of incongruence presented in Fig. 5 involve branches that are distant in the tree. Mechanistically, the pattern of discordance observed in Fig. 5 could be explained as resulting either from ancient hybridization or from deep lineage sorting (coalescent stochasticity). However, as hybridization is particularly common in grasses (see [29, 30]) ancient reticulation affords us the most parsimonious explanation for the discordance. This is especially the case for the Andropogoneae, where the chronograms (Figs. 6 and 7) show multiple lineages that diverged rapidly between 12.5 and 11.6 million years ago. This corresponds quite well with the central part of the Middle Miocene Climate Transition (MMCT)  and the start of the diversification of C4 grasses . Rapid radiation can often prove problematic for phylogenetic analyses, particularly near the backbone of the phylogenetic tree , though our more comprehensive partitioning scheme does generally improve branch support in this region (Additional file 4 and Fig. 3). Our findings are consistent with reticulate evolution being one of the driving forces behind this radiation. It is also perhaps unsurprising that three genera currently defined as incertae sedis within the Andropogoneae (Eriochrysis, Imperata, Pogonatherum) show signals of ancient reticulation with highly discordant genomic and plastid phylogenetic signals. Two of these genera, Imperata and Pogonatherum form a monophyletic grouping with Germainia in both chloroplast and genomic phylogenies (Figs. 3 and 4). The Germainiinae are currently defined as Apocopis, Germainia and Trachypogon. Though Trachypogon was not represented in our taxon sampling, Apocopis is represented in the low copy number gene locus phylogeny (Fig. 4) and is sister to Germainia. The surprise is that the gene locus phylogeny places Eriochrysis as the outgroup to the Germainiinae (a finding that is consistent with previous studies [16, 17]). It would seem that reticulation occurred early in the evolutionary history of the Germainiinae, so that genomic and plastid evolutionary histories differ. Based on the low copy number gene phylogeny (Fig. 4), our data support the inclusion of Imperata and Pogonatherum within the Germainiinae. The evolutionary histories of Coix, Dimeria and Ischaemum differ greatly between the gene locus and chloroplast phylogenies (Fig. 5) and increased taxon sampling may be required to resolve the true reticulate origins of these species. Possibly the most surprising discordance between the genomic and plastid phylogenies is the positioning of Sorghum. 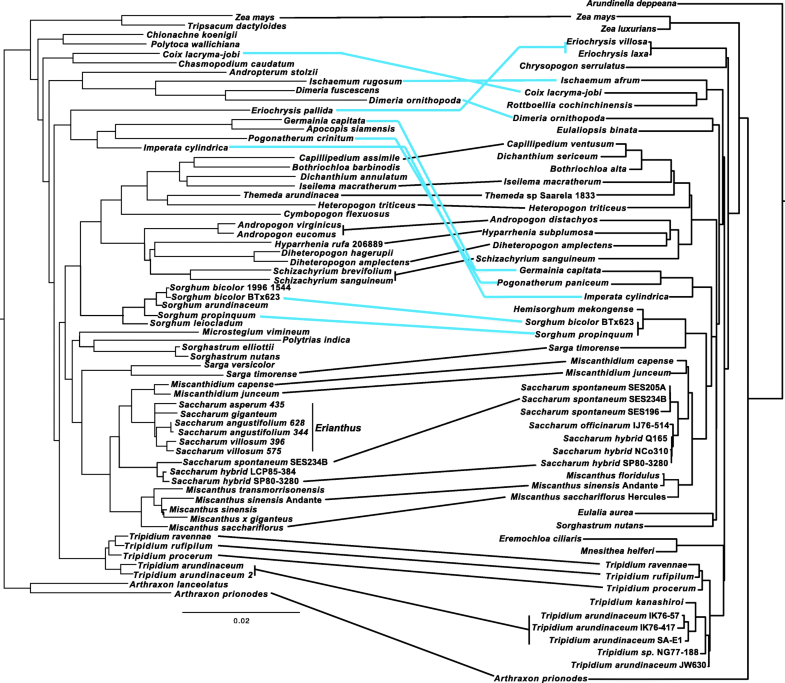 In the chloroplast phylogeny (Fig. 3) it emerges as sister to Sarga, with this joint clade being sister to the Saccharinae. However, in the genomic gene locus phylogeny, Sorghum is sister to the core Andropogoneae. This new placement of Sorghum is consistent with the work of Hawkins et al. and our recent work on extended ITS sequences . This means that Sorghum last shared a common ancestor with sugarcane 10.8 million years ago (Fig. 6) rather than the more commonly accepted 7.1 million years ago (Fig. 5). This also has implications for plastid/plastid+genomic datasets, which could lead to misleading phylogenetic interpretations. Previous to this study, the complete plastid sequence of only a single Erianthus species; Erianthus arundinaceus has been published . This is an East Asian accession (from the Shizuoka Prefecture of Japan). The SASRI E. arundinaceus accession (IK76–57) was collected in Indonesia (the IK designation represents a plant collected on the island of Kalimantan). The South African Sugarcane Research Institute accession SA-E1 was derived from India. Previous morphological studies  indicated that Indian and Indonesian accessions of E. arundinaceus were quite distinct, with Indian E. arundinaceus being closer to E. ravennae and E. procerus. Our phylogenies (Figs. 3, 4, and 5) show that genus Tripidium is monophyletic, with complete support. The genus is divided into two groupings, both with good support. However, Tripidium arundinaceum is clearly not monophyletic. The previously published Japanese accession forms an outgroup to our accession NG77–188, previously miss-identified as Saccharum robustum. These two species are basal to the remaining Tripidium kanashiroi and Tripidium arundinaceum accessions. T. procerum, T. ravennae and T. rufipilum cluster together and are sister to all the other Tripidium accessions. Indian Tripidium arundinaceum SA-E1 is basal to the crown Tripidium arundinaceum accessions, but is separate from Tripidium (Erianthus) ravennae. Thus, chloroplast data supports Indian Tripidium arundinaceum being phylogenetically more closely related to Indonesian T. arundinaceum than to T. ravennae. Both chloroplast-based and low copy number gene locus based chronograms (Figs. 6 and 7) show that Tripidium diverged from the other grasses about 12.1 Mya. The two crown Tripidium clades diverged about 7.3 million years ago (Fig. 6). The chloroplast analysis (Fig. 3) places Tripidium sp. NG77–188 and T. arundinaceum JW630 as outgroups to the crown clade formed by Tripidium kanashiroi and the Tripidium arundinaceum species. Monophyly of this entire grouping has 100% support in both plastome and low copy number gene locus phylogenies (with identical topologies) and monophyly of the two sub-groupings within Tripidium has excellent support. Thus, our study provides two independent analyses supporting Tripidium as a monophyletic genus that last shared a common ancestor with Saccharum species 12.1 Mya. As such, we propose that Tripidium should be the preferred genus name for these species and that they should be removed from genus Saccharum. Indeed, it is generally accepted that the demarcation line between species of Andropogoneae that could be members of the Saccharinae, and those which most certainly are not, are the core Andropogoneae. Species and genera that arose before the divergence of the core Andropogoneae (about 11.6 Mya) are not members of the Saccharinae, whilst genera that are sister to the core Andropogoneae could be members of the Saccharinae . Our plastid phylogeny, (Fig. 3) shows that the crown Tripidium group formed by T. kanashiroi and three T. arundinaceum accessions have two basal accessions. The first of these is T. arundinaceum JW630, diverging 7.73 Mya (Fig. 5) and the second formed by Tripidium sp. NG77–188 diverging some 7.54 Mya. These are evolutionarily distinct from the crown T. arundinaceum group and separated from them by over 2 million years. Tripidium sp. NG77–188 is also morphologically distinct from the crown T. arundinaceum grouping. Despite being characterized as T. arundinaceum, accession JW630 is the most basal of the group and it is separated from the remaining T. arundinaceum accessions by another species, T. kanashiroi. The presence of T. arundinaceum accessions in the basal and crown groups means that T. arundinaceum is not monophyletic. Thus, T. arundinaceum JW630 is, undoubtedly, a different species from the core T. arundinaceum and T. kanashiroi species assembled in this study, and the naming and identification of these basal Tripidium species requires further investigation. In our plastid analysis (Fig. 3), the monophyletic Tripidium clade is sister to a clade formed by Eremochloa ciliaris and Mnesithea helferi. It should be noted that Neighbor-Joining analysis supports the placement of Eulalia and Sorghastrum, but places Mnesithea and Eulalia as sister to Tripidium, but SH-aLRT supports the topology as presented. Indeed, support for Eremochloa/Mnesithea being sister to Tripidium is only slightly better than the topology where Eremochloa/Mnesithea is an immediate antecedent clade to Tripidium. This may be partly due to the rapid radiation seen in this portion of the phylogeny and increased sampling in this area may help resolve the uncertainty within the relative position of the Eremochloa/Mnesithea clade or uncertainty could be due to ancestral reticulate evolution. However, the uncertainty in the placement of these two clades does not affect our conclusions regarding Tripidium. Our study therefore provides excellent support for Tripidium as a monophyletic genus that last shared a common ancestor with Saccharum species 12.2 Mya. As such, we propose that Tripidium should be the preferred genus name for these species and that they should be removed from genus Saccharum. In addition, our recent study  gives a 3.4 million year window in which members of the Poaceae can hybridize in the wild. Tripidium species clearly fall outside this window and though they can be crossed by human mediation they cannot naturally hybridize in the wild. Indeed, our findings are entirely consistent with the problems in hybridizing these two very divergent genera that sugarcane breeders have encountered over the past 50 years. In addition, the large evolutionary distance between Tripidium and Saccharum explains why crosses between the genera result in the duplication and loss of incompatible chromosomes (as hybrids are intergeneric). Thus, in the strictest sense, those rare hybrids that occur between Tripidium species and Saccharum species should be defined as partial hybrids and not as true hybrids. As only three species have previously been formally included in genus Tripidium, our findings show that the following new combinations are necessary: Tripidium arundinaceum (Retz.) Lloyd Evans comb. nov. based on Saccharum arundinaceum (Retz. ); Tripidium procerum (Roxb.) Lloyd Evans comb. nov. based on Saccharum procerum (Roxb. ); and Tripidium kanashiroi (Ohwi) Lloyd Evans comb. nov. based on Saccharum kanashiroi (Ohwi). We confirm by molecular phylogenetic data that Saccharum rufipilum is not a member of genus Miscanthus and is sister to Tripidium ravennae. As such, it must be brought into genus Tripidium as Tripidium rufipilum (Steud.) Lloyd Evans comb. nov. based on Saccharum rufipilum (Steud.). With the previous combinations, this results in Tripidium being a genus with seven confirmed species. To aid identification of these species, a new key to Tripidium identification is presented in Table 2. That Tripidium species’ physical characteristics can be ranked in this fashion is further evidence for the monophyly of Tripidium as a genus. Our low copy number gene phylogeny places Germainia and the extended Germainiinae as a clade that is separate from Tripidium, but which is sister to Tripidium, the core Andropogoneae and the Saccharinae sensu lato as a whole. Thus Tripidium and Germainia are not closely allied as had previously been suggested . As our low copy number gene locus phylogeny (Fig. 5) places Sorghum as an outgroup to the core Andropogoneae, we are left with a core Saccharinae subtribe of Miscanthus, Miscanthidium and Saccharum, which all lie within the wild crossing range of about 3.8 million years. Figure 3 clearly shows that the Saccharinae are not monophyletic and that three genera previously included in both the Saccharum complex and the Saccharinae (Tripidium, Sorghum and Eriochrysis) can be excluded as they are more distantly related to Saccharum than the core Andropogoneae. Pogonatherum and Imperata can also be excluded due to evolutionary distance, particularly if the low copy gene locus data (Fig. 4) is given precedence. It should be noted that genus Miscanthidium is not currently defined as part of the core Saccharinae (Fig. 3). Previously these species were included within Miscanthus  but our data clearly show that they are far closer to Saccharum than to Miscanthus. Our low copy number gene locus phylogeny (Fig. 4) also shows that New World Erianthus species are sister to Miscanthidium, thus they are part of the Saccharinae, but distinct from Saccharum (the Erianthus + Miscanthidium clade being sister to Saccharum). Our phylogenies also demonstrate that the Sorghinae, as currently defined, is not monophyletic, with Sorghastrum (currently defined within the Sorghinae) clearly lying outside the Sorghinae, being sister to the core Saccharinae. Three other genera: Bothriochloa; Capillipedium and Dichanthium lie within the core Andropogoneae and can also be excluded from the Sorghinae. Chrysopogon, which is also currently included within the Sorghinae  can also be excluded as it is distal to the core Andropogoneae. The split between Sorghum and Sarga species is further emphasized as low copy number gene locus phylogenetics places Sorghum as sister to the core Andropogoneae, whilst Sarga is sister to the core Saccharinae. Thus, our data supports a core Sorghinae clade formed only from Hemisorghum and Sorghum and a Saccharinae clade formed from the genera Saccharum, Miscanthus, Miscanthidium and Erianthus that has Sarga as a sister clade. Phylogenetically, we describe two new subtribes, as there is a natural clade formed from Eriochrysis pallida, Germainia capitata, Apocopis siamensis, Pogonatherum crinitum and Imperata cylindrical that can be encompassed within the Germainiinae. An extended clade formed from Sarga, Miscanthus, Miscanthidium, Erianthus and Saccharum could be given the subtribe name ‘Saccharinae’. The genera Tripidium, Eulalia and Eriochrysis should be excluded from the Saccharinae as they break the sub-tribe’s monophyly and are too distant from Saccharum to hybridize with Saccharum species in the wild. By the same argument Chrysopogon, Bothriochloa; Capillipedium, Dichanthium and Sarga should be excluded from the Sorghinae. We also clearly demonstrate that genus Tripidium is not allied to Germainiiae, as suggested by Soreng et al. , though the Germainiiae are sister to Tripidium. Here we need to make a clear distinction between the ‘Saccharum complex’, a group of species that can interbreed in the wild (this can only include the genera: Miscanthus, Miscanthidium and Saccharum, as well as the New World Erianthus species ) and the Saccharinae, a taxonomically monophyletic grouping that includes genus Saccharum (in totality this subtribe would include Saccharum, Miscanthus, Miscanthidium, the New World Erianthus species and Sarga possibly with the inclusion of Microstegium vimineum, Polytrias indica and Sorghastrum which forms an outgroup to the ‘Saccharum complex’ (with good support)) based on low copy number gene phylogenetics (Fig. 4). We also demonstrate, based on low copy gene locus phylogenetics, that genus Erianthus, as originally defined, is not monophyletic and should be divided into Tripidium and Erianthus, with genus Erianthus only including the New World species. Moreover Erianthus species are sister to Miscanthidium and are therefore phylogenetically distinct from Saccharum. As Erianthus giganteus is the type species we propose that New World Erianthus species should be removed from genus Saccharum and returned to genus Erianthus. Despite over 50 years’ worth of efforts in introgression breeding, there has been little success in the generation of valid Saccharum/Erianthus hybrids. Our phylogeny clearly reveals that, as genera, Saccharum and Tripidium are 8.6 million years divergent, last sharing a common ancestor 12 million years ago. Tripidium is a monophyletic grouping composed of seven species, with a potential for the addition of two additional species, yet to be formally described. The inclusion of Erianthus sect Ripidium (which we re-classify as Tripidium species) within the ‘Saccharum complex’ has led sugarcane breeders down a blind alley for five decades and more, whilst breeders have ignored the potential of the New World Erianthus species, which do lie within the wild crossing window with sugarcane. Here we resolve the confusion and re-define the membership of the genus Tripidium, the ‘Saccharum complex’ and the Saccharinae based on robust molecular systematic studies. Tripidium arundinaceum and Tripidium ravennae leaves were collected from the South African Sugarcane Research Institute’s (SASRI) collection, along with four other samples identified as Tripidium, but of previously unknown species. Tripidium procerum, Tripidium rufipilum and Saccharum spontaneum SES196 were from the USDA collection and DNA sequencing for these accessions has been reported previously . For the SASRI accessions, total DNA was isolated from liquid nitrogen frozen and ground leaf material using the standard CTAB method according to Wang et al. . Complete chloroplasts were amplified using the 13 primer pairs designed for this project (Additional file 1). Polymerase Chain Reaction (PCR) amplifications were performed using Phusion Hot Start II High-Fidelity DNA Polymerase (Thermo Scientific). Each reaction contained 50 ng of high quality genomic DNA, 1.5 mM MgCl2 with 0.2 mM each deoxynucleotide triphosphates (dNTPs), 0.5 M each of forward and reverse primer, 0.4 Units Phusion Hot Start II High-Fidelity DNA Polymerase and reaction buffer as supplied by the manufacturer. Thermal cycling conditions were as follows: Initial denaturation at 98 °C for 1 min, followed by 35 cycles of: 98 °C for 10 s and annealing and extension at 68 °C for 15 min. A final extension step was performed at 72 °C for 10 min followed by a hold at 4 °C. Amplicons were separated by gel electrophoresis (see example gel lanes, which are available in PDF format as an additional document Additional file 2), prior to gel elution and Illumina sequencing (Genotypic Technology Pvt. Ltd). Using Kew’s GrassBase  descriptions as a foundation, basic phenotypic characters for T. arundinaceum, T. kanashiroi, T. bengalense, T. ravennae, T. procerum, T. rufipilium and T. strictum were extracted. Potential Tripidium accessions from SASRI’s living collection were phenotypically characterized and matched against the above descriptions. Once identified, further characters were taken from SASRI’s accessions for T. arundinaceum, T. kanashiroi and T. ravennae. Further analysis of Tripidium strictum was made against the Missouri Botanical Garden (MBG) specimen of Saccharum strictum (MO-2397278). For T. bengalense, T. rufipilum and T. procerum the Herbarium Kewense (K) specimens of Saccharum bengalense (K000943381), S. rufipilum (K000309025) and S. procerum (K001128357) were analysed. Unique characters were used to generate a key to recognition of Tripidium species. The sequences derived from three USDA accessions were assembled as described previously  with data downloaded from NCBI’s sequence read archive (SRA) for the accessions: SRR2899231; SRR2891248 and SRR2891271, using Mirabait  and SPAdes v 3.10 , with a baiting k-mer of 27 and an assembly k-mer series of 25, 33, 55 and 77. Scaffolds were arranged against the previously published assembly of Erianthus arundinaceus JW63 (NCBI accession LC160130.1) and the region corresponding to the second inverted repeat was copied, inverted and stitched into the genome (that this region represented a repeat was confirmed by increased read coverage compared with the remainder of the genome). The SASRI accession raw read data were subject to adapter trimming and cleaning with Trimmomatic . Trimmed reads were assembled, typically generating seven or eight scaffolds, which could be arranged on the Erianthus arundinaceus backbone. Any small gaps in the initial assemblies were filled by excising a 2 kb region around the gap and re-assembling this region by baiting reads with Mirabait (k-mer of 31) and assembling the baited reads with SPAdes before inserting the reassembled region to close the gap in the main assembly. Following Estep et al. , low copy number regions were assembled for the following genes: Aberrant panicle organization1 (apo1), Dwarf8 (d8), two exons (7 and 8) of Erect panicle 2 (ep2), and Retarded palea 1 (rep1). We assembled these regions from the following GenBank sequence read archive (SRA) accessions: Sorghum propinquum (Knuth) Hitchc. (SRR072055); Sarga versicolor (Andersson) Spangler (SRR427176); Sarga timorense (Kunth) Spangler Gypsum 9 (SRR424217); Miscanthidium junceum (Stapf) Stapf (SRR396848 and SRR396849); Miscanthus sacchariflorus (Maxim.) Benth. & Hook. f. ex Franch. var. Hercules (SRR486748); Miscanthus x giganteus JM Greef & Deuter ex Hodk. & Renvoize (SRR407328 and SRR407325); Miscanthus transmorrisonensis Hayata (SRR396850); Saccharum hybrid hort. ex RM Grey LCP85–385 (SRR427145); Saccharum hybrid SP80–3280 (SRR1763296), Saccharum spontaneum L. SES234B (SRR486146), Sorghum bicolor (L.) Moench BTx623 (SRR1945055) and Sorghum arundinaceum (Desv.) Stapf PI300119 (SRR999023). Miscanthus sinensis Andersson cv. Andante and Andropogon virginicus L. genomic reads as well as Sanger sequenced low copy number reads for Tripidium arundinaceum 2 were kindly donated by BeauSci, Cambridge, UK. For Tripidium procerum (ibid) and Tripidium rufipilum (ibid), as the data was low coverage, reads were mapped to the existing Tripidium ravennae gene fragments with BWA  prior to consensus sequence calling with the Integrative Genomics Viewer (IGV) . The consensus sequences were used as templates for gene assembly in these sequences. Gene loci were assembled as described previously  using the closest orthologue for each gene for Mirabaiting and SPAdes for assembly. In Miscanthus, M. sinensis was used to bait the primary or ‘A’ genome for each species. All Miscanthus sinensis cv Andante, Andropogon virginicus assemblies along with the T. rufipilum and T procerum assemblies and the Tripidium arundinaceum 2 sequences have been deposited in EMBL/GenBank under the project identifier PRJEB22229. These and all other gene region assemblies were also deposited in the Dryad digital repository . To ensure that the assembly was of high quality, all assembled chloroplasts were finished and polished with a novel pipeline. Raw reads from the SRA pool were mapped back to the assembly with BWA , duplicate sequences were tagged with Picard tools  prior to optimizing the read alignment with GATK  and finally polishing and finishing with Pilon 1.2.0 . The finished chloroplast alignments were orientated so that they finished with the IRB region prior to batch upload to the Verdant annotation server  for automated annotation. Annotation files were downloaded from Verdant in ‘.tbl’ (Verdant native) format. Genes and pseudogenes identified from our previous analysis , and which were not present in the Verdant annotation, were mapped manually with BLAST and were placed in a separate ‘.tbl’ format file. A custom BioPerl script  was written that integrated the Verdant output and the additional gene output along with data corresponding to gene annotation and cultivar level taxonomies prior to outputting an EMBL format file and a chromosome file that could be automatically uploaded to the EMBL database. All assembled chloroplasts were submitted to ENA under the project identifier PRJEB20532. Whole plastid alignments were performed with SATÉ (version 2.2.2) , using MAFFT  as the aligner, MUSCLE  as the sub-alignment joiner and RAxML  as the phylogenetic analysis application. Alignment iterations were run for 20 generations past the iterations that yielded the best likelihood score to ensure that the correct global alignment minimum had been reached. This optimal alignment was subsequently edited manually to remove any obvious errors and to trim all gaps of > 20 bp due to only a single sequence to 10 bp (a list of all chloroplast assemblies with sequence and voucher accessions are given in [Additional file 3]). This alignment was used to generate an initial phylogeny (corresponding to [Additional file 4]), but the raw alignment was used for the alignment finishing steps. Gene regions assembled in this study were merged with the equivalent gene regions from a subset of the data from Welker et al. . All regions were aligned independently using SATÉ, with MAFFT as the aligner and Muscle as the sub-alignment joiner. Alignments were adjusted manually and trimmed. Each individual alignment was input into RAxML and a phylogenetic analysis (100 replicates) was run to identify the most likely tree. If alternate copies of genes were in the same position in the phylogeny these were linked. As we were not analysing close hybrids in this study, only primary copies of each locus were retained. Subsequent to alignment optimization (see below) individual gene/locus alignments were stitched together with a custom Perl script. If the positions of genes were uncertain, all alternate positions were generated. The phylogeny was run with RAxML and the sub-alignment giving the strongest phylogenetic signal was chosen. Using this methodology, we generated the optimal alignment. For the phylogeny generated here, only the alignment yielding the dominant phylogenetic signal was chosen and secondary copies of genes were eliminated. The final, optimized, alignment as well as the phylogram determined from this alignment were deposited in TreeBase (TB2: S23649). The output alignment was edited to remove any obviously over-inserted gaps and RAxML (see below) was run for 100 generations to generate a most likely phylogeny. This phylogeny and the manually fixed alignment were used as input for a second round of Prank analysis. After this round of analysis, as the input and output alignments yielded the same tree topology, Prank optimization was deemed complete. Finally, to reduce long-branch issues, all insertions of greater than 20 bp created by just a single sequence were trimmed to 20 bp. This final alignment was used for all subsequent analyses. The whole plastid alignment was divided into LSC, IRA and SSC partitions. These partitions were further divided into protein-coding gene, RNA-coding gene and non-coding regions. The regions were isolated with the BeforePhylo.pl  script and merged into separate partitions. The IRA region contained only a single tRNA encoding gene, which was added to the SSC RNA-gene partition. This yielded a total of eight partitions. Best-fit evolutionary models for each partition were selected using JModelTest2  and the AICc criterion. The best-fit models were as follows: LSC protein coding: TPM1uf + I + Γ, LSC RNA genes: TVM + Γ; LSC non-coding: TVM + Γ; IRA protein coding: TVM + I + Γ; IRA non-coding: TVM + Γ; SSC protein coding: TPM1uf + I + Γ; SSC RNA-gene: TrN + I + Γ and SSC non-coding: TVM + I + Γ. The low copy number gene loci were divided into their five component partitions. Each partition was tested with JModelTest2 and the AICc criterion to determine the best-fit evolutionary models. The optimal models were as follows: apo1: GTR + Γ; d8: GTR + Γ + I; ep2-exon7: TIM2 + G; ep2-exon8: TrN + Γ + I; rep1: HKY + G. The partitions determined above and their closest model equivalents were used for all subsequent analyses. Neighbor-joining phylogenies were generated with the Ape library in R . Bayesian analyses were run with MrBayes (version 3.1.2) , Maximum Likelihood analyses were run with RAxML (version 8.1.17)  and SH-aLRT analyses were run with IQ-Tree . For both the chloroplast and low copy number gene datasets Bayesian Markov Chain Monte Carlo (MCMC) analyses were run with MrBayes 3.1.2, using four chains (3 heated and 1 cold) with default priors run for 20,000,000 generations with sampling every 100th tree. Two independent MrBayes analyses, each of two independent runs, were conducted. To avoid any potential over-partitioning of the data, the posterior distributions and associated parameter variables were monitored for each partition using Tracer v 1.6 . High variance and low effective sample sizes were used as signatures of over-sampling. Burn-in was determined by topological convergence and was judged to be sufficient when the average standard deviation of split frequencies was < 0.001 along with the use of the Cumulative and Compare functions of AWTY . The first 50,000 (25%) sampled generations were discarded as burn-in, and the resultant tree samples were mapped onto the reference phylogram (as determined by maximum likelihood analysis) with the SumTrees 4.0.0 script of the Dendropy 4.0.2 package . Maximum Likelihood inference and bootstrapping were performed in RAxML using the same partitioning schemes as detailed above. To obtain the best tree RAxML was run without resampled replicates for 100 generations. The most likely whole plastome tree was obtained in the 70th generation and the most likely low copy number gene locus tree was obtained on the 53rd generation. These were used as the respective reference tree topologies in all subsequent analyses. To confirm this topology, a second, independent run of RAxML with different seed parameters was also run for both data matrices. In all cases, replicate tree topologies were identical. To provide support for the Maximum Likelihood phylogeny, a total of 10,000 bootstrap replicates were analysed. Replicate trees were summarized with SumTrees before being mapped onto the best maximally likely tree as determined above. As an additional measure of branch confidence, SH-aLRT analyses were run for 2500 replicates with IQ-TREE, using the -bnni option  to reduce the risk of overestimating branch supports due to severe model violations. Divergence times were estimated using BEAST 2.4.4  optimized for OpenGL graphics running on a MacBook Pro (15-in., 2017 2.9 GHz Intel Core i7) with 16Gib RAM. The concatenated analysis (LSC, IRA and SSC along with their coding gene, RNA gene and non-coding partitions) was run for 20 million generations with sampling every 1000th replication under the BEAST equivalents of the JModelTest2 models (as defined above) with six gamma categories. The tree prior used the Calibrated Yule Model  with a relaxed lognormal clock and site models unlinked. Partitions were defined as above. The XML output from BEAUTi was edited to set the starting tree as the most likely tree obtained from RAxML analysis. The site model followed an uncorrelated lognormal relaxed clock . The whole chloroplast analysis was rooted to Arundinella deppeana, whilst the low copy number gene locus analysis was rooted to Arthraxon prionodes and Arthraxon lanceolatus. The age of Zea mays divergence was estimated as a normal distribution describing an age of 13.8 ± 2 million years  whilst the age of the root was set as 24 ± 4 million years for the chloroplast phylogeny and 19 ± 4 million years for the low copy number gene loci analyses, both based on prior analyses (D Lloyd Evans, personal communication). Convergence statistics were estimated using Tracer v.1.6  after a burn-in of 20,000 sampled generations. Chain convergence was estimated to have been met when the effective sample size was > 200 for all statistics. Tree samples were integrated with SumTrees to generate the maximum clade credibility tree and to determine the 95% highest posterior density (HPD) for each node. The final tree was drawn using FigTree v.1.4.3 . The final alignments and phylogenies are available from TreeBase . We thank the South African Sugarcane Research Institute for supporting this work. We also thank Mr. E. Albertse for performing the DNA isolation, PCR amplifications and DNA extractions. We are grateful to the Missouri Botanical Garden (MBG) and the Royal Botanic Gardens, Kew (K) herbaria for access to digital specimens. This work was supported by the South African Sugarcane Research Institute. Sequences assembled and annotated in this study are available from ENA/GenBank under the project accessions PRJEB20532 and PRJEB22229. The sequence datasets and tree topologies generated and/or analysed during the current study are available from the TreeBase repository, http://purl.org/phylo/treebase/phylows/study/TB2:S23649. Low copy number gene assemblies, low copy number gene alignments, low copy alignment matrix and maximum likelihood phylogenies along with the chloroplast partition data matrix and chloroplast maximum likelihood phylogeny are available from the Dryad digital repository, https://doi.org/10.5061/dryad.1k5s048. All associated computer code has been uploaded to GitHub, https://github.com/gwydion1/bifo-scripts.git. SVJ and DLlE conceived the initial experiment, based on plastome sequencing. DLlE conceived the low copy number gene analysis, amended and developed the experimental design, designed the PCR primers, performed the phenotypic analyses, assemblies and phylogenetics, developed the software scripts, analysed and interpreted the data and wrote the paper. SVJ provided the SASRI plant materials and proofread the manuscript. JW provided the sequence data for the USDA accessions. DLlE arranged for the remainder of the plant materials. All authors read and approved the final version of the manuscript. Sampling of plant leaf materials (not destructive to the plant) was conducted according to the South African Sugarcane Research Institute’s guidelines. Kew Gardens GrassBase Entry for Saccharum. http://www.kew.org/data/grasses-db/sppindex.htm#S. Accessed 10 Oct 2017. NCBI Taxonomy entries for genus Tripidium. https://www.ncbi.nlm.nih.gov/Taxonomy/Browser/wwwtax.cgi?id=1612336. Accessed 12 Oct 2017. Folk RA, Soltis PS, Soltis DE, Guralnick R. New prospects in the detection and comparative analysis of hybridization in the tree of life. Am J Bot. 2018 in press. https://doi.org/10.1002/ajb2.1018. Guo X, Thomas DC, Saunders RM. Gene tree discordance and coalescent methods support ancient intergeneric hybridisation between Dasymaschalon and Friesodielsia (Annonaceae). Molecular Phylogenetics and Evolution. 2018:127:14–29. DOI. 2018. https://doi.org/10.1016/j.ympev.2018.04.009. NCBI Taxonomy entries for genus Saccharum. https://www.ncbi.nlm.nih.gov/Taxonomy/Browser/wwwtax.cgi?id=4546. Accessed 12 Oct 2017. NCBI primer design tool. https://www.ncbi.nlm.nih.gov/tools/primer-blast/. Accessed 23 Sept 2017. Engels B. Amplify4 In Silico PCR. https://engels.genetics.wisc.edu/amplify/. Accessed 7 Oct 2017. Clayton B, Vorontsova MS, Harman KT, Williamson H. GrassBase — The Online World Grass Flora. http://www.kew.org/data/grasses-db.html. 2006 onwards. Accessed 6 Oct 2017. Tropicos entry for genus Tripidium. http://tropicos.info/NamePage.aspx?nameid=50314867&tab=subordinatetaxa&projectid=48. Accessed 12 Oct 2017. Picard tools. Available from: http://broadinstitute.github.io/picard/. Last accessed 10 Nov 2017. Lloyd Evans D. Sequence annotation code. Available from: https://github.com/gwydion1/bifo-scripts.git. Accessed 10 Nov 2017. Zhu, Q. 2014. BeforePhylo.Pl version 0.9.0 available from: https://github.com/qiyunzhu/BeforePhylo. Accessed 12 Nov 2017. Nguyen L-T, Schmidt HA, von Haeseler A, Minh QA; IQ-TREE: A Fast and Effective Stochastic Algorithm for Estimating Maximum-Likelihood Phylogenies, Mol Biol and Evol, 2015; 32:268–274. https://doi.org/10.1093/molbev/msu300. Rambaut A, Suchard MA, Xie D, Drummond AJ. Tracer, Version 1.5. http://tree.bio.ed.ac.uk/software/tracer/. Accessed 7 Oct 2017. FigTree, available from http://tree.bio.ed.ac.uk/software/figtree/. Accessed 10 Nov 2017. Lloyd Evans D, Joshi SV and Wang J (2017) Data from: whole chloroplast and gene locus phylogenies reveal the taxonomic placement and relationship of Tripidium (Panicoideae: Andropogoneae) to sugarcane. TreeBase. http://purl.org/phylo/treebase/phylows/study/TB2:S23649.